Ginger Made: By Hand London Flora Dress! Hi, guys! I’m so excited to show you my newest dress! Yay! I was lucky enough to be a tester for By Hand London‘s newest sewing pattern, the Flora Dress. I’ve had the hardest time keeping my trap clapped- I wanted to spill the beans so badly! Flora has two bodice options, a fitted tank with a high neckline, or this faux wrap. I generally don’t like wrap dresses (I know, I’m alone in this) and I rarely even wear a v-neck, but I thought it would be fun to try something different from my usual style. You can also choose between a pleated skirt and a pleated skirt with a dipped hem (I chose the latter). 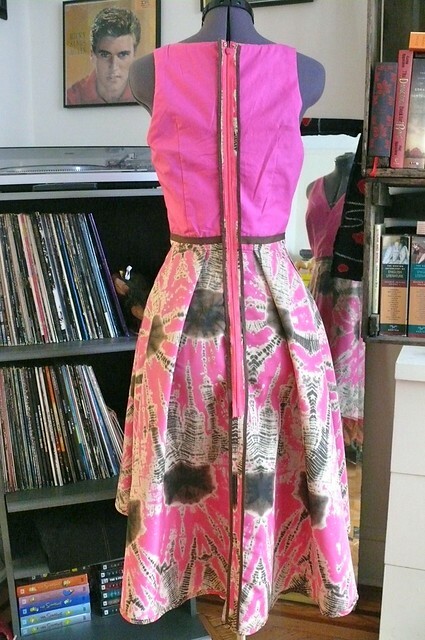 I used a bright polyester taffeta from Mood Fabrics NYC. It was kind of a strange fabric, very tightly woven (it was really hard to get pins to pierce it!) and almost like windbreaker material, so it might be kind of an unusual choice for a party dress, but it has lots of body and I thought that would make for a fun, billowy skirt. I used a sharp needle and low tension, which worked well. The pattern is very easy and quick to sew up. I understitched the lining very carefully along the bodice and used a lining that was very similar in color to minimize flashing the lining, which worked really well. Here’s my perky pink lining, made with cotton shirting from Mood. You could easily add a skirt lining, but I didn’t feel like I needed it. I used French seams where I could, and where I couldn’t, I used ready-made bias binding from my stash that coordinated perfectly! If you make the version with the dipped hem, you need to make sure that your center back seam is nice and pretty since you’ll see peeks of it! Hooray for pretty seams! I haven’t made a lined bodice with a faux wrap before, so I was glad to have it explained clearly as figuring it out on my own would have melted my brain (but that’s just me). You need to press under the lining and dress shell seam allowances at the arm holes and then slip stitch them together. I’d never done this before and try to avoid hand stitching as much as possible, but I couldn’t figure out another way to finish the seam allowances! To avoid puckers, I ran a basting stitch just inside the seam allowances around the arm hole, then clipped every 1/2″ or so around the arm hole before pressing them under. I left the basting stitch in because I was worried about fraying- hopefully that will work! I’m a little bit unhappy with the fit, sadly. I made a silly mistake, so it’s all my fault. I made a muslin and decided I wanted the waist to be more fitted (I tend to under-fit rather than over-fit to avoid this, but I thought the dress would look nicer if the waist was more emphasized). But when I made the changes to the muslin, I must have stretched it out a bit because the final version in the fashion fabric is too tight (the polyester has absolutely no give whatsoever). There are diagonal lines pulling from the waist to the bust, which is kind of annoying. I also didn’t think about the fact that taking in the waist pretty drastically would pull the bust darts closer to the side seams, so they’re not quite right now, either. I’ll know better next time! Fit issues notwithstanding, I’m really happy with this dress! It’s a fun party dress, and I feel like a princess when I’m twirling around in the skirt (even if I look like an idiot in reality)! I’m looking forward to making another! I know I sound like a total fangirl, but the By Hand London girls have a knack for designing patterns that I didn’t know I really wanted to wear. I just love their aesthetic! This is what happens when I try to twirl. So what do you guys think? Do you like this pattern? What’s your perfect party dress? Have you made it already, or is it something you’re still dreaming of making one day? This looks great on you! I don’t notice any fit issues – just fun party dress potential. I have to admit, the first thing I thought of is how cold it must’ve been when you took these photos (like everyone else who commented apparently!). I hope these were taken two weekends ago when we managed to hit the 50s around these parts! No such luck- I took them Sunday when we were worrying about another snowstorm! 🙂 Brrrrrrrr! I’m ready for summer! Thank you, Nat! It was really cold that day (and today, and what feels like every other day of my entire life… it’s been a long winter!). So gorgeous, although I am absolutely with you on wrap dresses. I never feel comfortable in them, but I do love the tank style bodice, so will be adding this to my ever growing post-pregnancy, post-feeding dress pattern wish list!! I’m looking forward to trying the tank style next! You would look lovely in it! Hope you’re enjoying lots of good time with baby! You look AMAZING!!!!! Dress looks beautiful!!!!! Okay, now I got to go back and read the post. I SO want to see your version!!!!!!!!!!!!!! Definitely fun and flirty! Looks really great on you too! To be honest, when I looked at the pattern envelope previews on Instagram, I was like “yeahhhh… it’s nice, but I don’t see myself wearing a dipped skirt or that style bodice” but after seeing it on you, I am sold!!! I want one!!!! I’ve only ever made one “v neck” bodice, it was a Butterick 5455 and the neck looked awful on me, I think the bust was still way to big despite cutting the smallest size (guess I needed to make adjustments to it). I really want this bodice!!!! Same re the fan girl statement, I must sound like a broken record on my blog, saying how much I love the BHL patterns, but I really do!! Their style really suits my style, and I have never loved a pattern so much that I would go through hell to get the perfect fit. Congrats on the beautiful dress, I really love it on you!!!! This would look so, so, so, so cute on you! 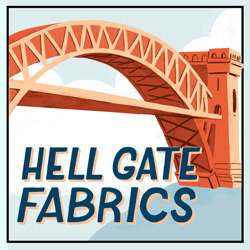 I can’t even wait to see what fabric you would choose!!!!! Ahahaha! My sentiments exactly! I’m about ready to move to the southern hemisphere! You’ve done a great job with this dress. You’ve really pulled it off and I love the print. You’ve gone way beyond the call of duty standing outside in a summer dress in March!! 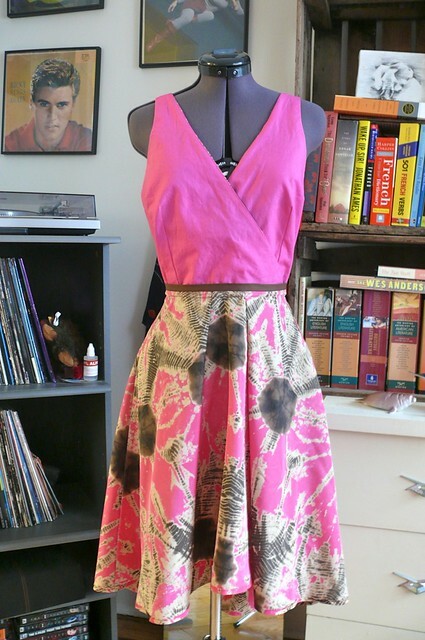 Pingback: Pink Floral Maxi Anna | Sew, Laura, Sew! Lovely dress! I’m not usually a big fan of dipped hem skirts but all the gorgeous versions of Flora from you and the other pattern testers are making me change my mind! Such a pretty and feminine dress, you look great in it. This is super cute on you!! I think you should wear this style (and twirl!) more often. I’m intrigued by your description of that poly fabric, because it totally doesn’t come across in your pictures. It’s really strange fabric, and actually worked much better than I thought it would (I was prepared for some major headaches pressing it, but it responded well to low heat). First, this is the PRETTIEST version of this dress I’ve seen so far and it looks glorious on you! Second, I had those shoes back in 1973 and a blue suede version in 1977. Third, Ricky Nelson??? Blue suede?!?! I want!!!!! I’d love a few more pairs of these- they’re really, really comfortable and cute! I’m not ashamed to admit I’m a sucker for Ricky Nelson! He’s too swoon-able! Beautiful! My mind is made up after seeing your lovely faux wrap version – I need to order this pattern! Another awesome dress! You are very talented! Oh, thanks, Lizzy! You’re too sweet! This is lovely, and the inside is finished so prettily! It’s great to see this version of the neckline sewn up, suits you beautifully and I know what you mean about it feeling like such a party dress! I didn’t have time to muslin mine for the testing deadline, so it’s ended a little on the big side, but I love it so much that I may actually take it apart and fix it! I can’t wait for your post- I want a closer look at your dress! It looks so lovely! CUUUUUTEEEEE!! Gah, this looks so good on you! I love how that fabric gives the skirt a big ol’ structured shape – perfect part dress, indeed! Thanks, girl! Too bad it’s so damn cold here or we could have a Flora party!!! I’m sorry it’s too tight, but it LOOKS super flattering! I love the drape of the fabric, and the pattern is awesome! Super cute. Wow! How did I miss this! Love love the fabric you chose, and whatever you think about the fit it looks just amazing on you! twirl away! Thank you, lady! This was a really fun pattern to sew! This is soooo beautiful. Absolutely love it. Thank you, Sophie! I hope you make this one- I’d love to see your take on it! Check you and your sassy v neck self out! Loving the fabric choice- it’s crazy awesome and you look fierce! SUPER pretty! I love the cut and the print. Such a flattering dress! Gorgeous! I’m with you on not liking wrap dresses, although I don’t mind a nice faux wrap. And I love this. But, honey, you look like you need some cocoa, with a dash of something a wee bit stronger. Have you thawed out yet? Oh my gosh, I was SO COLD in these pictures! The shots all look so stupid with the bright dress in the middle of the grey, cold background, hahaha! It’s been fun seeing different versions of this dress pop up in the last few days, but yours is my favorite by far! That fabric is to die for! I’m liking this one on other people, but I know that it won’t work on me (either bodice version) so sadly, I have to sit this one out. Thank you, Gail! This is your signature color! I’m still thinking about a pink coat like yours, although I’m not sure I could pull it off! Thanks, Lizzy! Yours are so beautiful! YAY! I love your version Sonja! I also tested the dress but made the other version, after seeing your faux wrap version though, I think I need to make it asap! I’m so excited to see your version! I bet it’s adorable! So cute! I LOVE that fabric too! Hope you didn’t catch a cold – it looks super freezing in New York still! Gorgeous party dress! The background looks so chilly, but that dress shows optimism for warm weather. Dang girl! The inside front view looks like it’s own dress! Aww, thanks, Tasha! Every once in a while I like to get fancy! Me, too! I rarely wear poofy party dresses, but they’re a really fun change of pace! Dude that fabric is so awesome!!! I love the fabrics that look so crisp but are somehow so drapey at the same time. I’ve always wanted to sew with silk dupioni for that reason. I’ve yet to sew any of the By Hand London patterns but I’ve never seen a single one that didn’t look amazing on the person who made it. Seriously! Thanks girl! You’re too kind! Amazing job on this dress, Ginger! As a matter of fact, it’s my favorite rendition 🙂 When are you coming to SC? Love this dress! The fabric choice is stellar and I love dresses that have a good swoosh to them, and I think this is fits the bill perfectly. You may have just sparked my next pattern obsession! What the hell Sonia…. it’s effing freezing out and you wore this (totally gorgeous) SUNDRESS brazenly bare-legged?? You crazy. Girl, you are brave because there has been one day in the last six months on which you could have worn that lovely dress! Love the print and the style on you. Pray for Spring so you can wear it! This is really pretty. Looks like you’re getting ready for spring! Thanks, girl! I don’t think spring is ever going to arrive (it was snowing last night as I was leaving work! ), but when it does, I’ll be good and ready! Sold! I just ordered the Flora dress pattern from By Hand. I love your choice of fabric and your enthusiasm for pretty seams! I will try your method of finishing the zip. Thank you for sharing! !